In October of 1996, Capt. Philip Gaetini of Ladder Co. 123 crawled through smoke in a Brownsville building to help in the rescue of young girl and boy whose mother had left them home alone. Unfortunately, two children perished as a result of the intense fire. It must have seemed like a replay of that disastrous event to Capt. Philip Gaetini when Ladder Co. 123 responded to a blaze in a two-story brownstone duplex located in the Crown Heights section of Brooklyn during the early morning hours of April 30. Flames were venting from all windows when Ladder Co. 123 arrived.Firefighter Curt Meyran had the O.V.M position and was told by the civilians that two young children were still in the building. The children’s grandmother, Mary Chambers, was in the group, and frantic that the babies would be lost. Reacting quickly, Firefighter Meyran ran to the rear yard of the building, scaled a 4-foot chain link fence, and forced his way through the rear entry into the kitchen. Meanwhile, Capt. Gaetini was further informed that the youngsters were trapped in the basement. He proceeded to enter the front of the building, hoping to gain access to the basement through the interior stairs. Capt. Gaetini found his way to the basement door, opened it, and was hit with intense heat from the fire that has started to come up the interior staircase and into the parlor area. While searching the parlor floor for the children, Firefighter Meyran encountered Capt. Gaetini who told him the fire was located in the basement, that the basement stairs were untenable, and that the children were believed to be trapped on that lower level. Remembering an exterior cellar door he had seen during his run from the street to the rear of the building, Firefighter Meyran and Capt. Gaetini went to the outside of the building and forced entry into the basement. They proceeded down the cellar steps, and forced entry through another door where they were met with intense heat and smoke that sent them to their hands and knees. As the danger increased, Firefighter Meyran and Capt. Gaetini searched the basement level until they heard a low moan. Trying to key in on the sound, they split up and Firefighter Meyran moved forward until he came to a doorway. He crawled into the room beyond, and felt a bed. Sweeping the top of the bed with his hand, Firefighter Meyran located a 3-year-old girl, Tene Louise. Conditions were deteriorating rapidly. There was no door between the bedroom and the fire area. By now, those on the outside of the building were seeing 8-foot flames coming out of the basement windows. Time was running out. 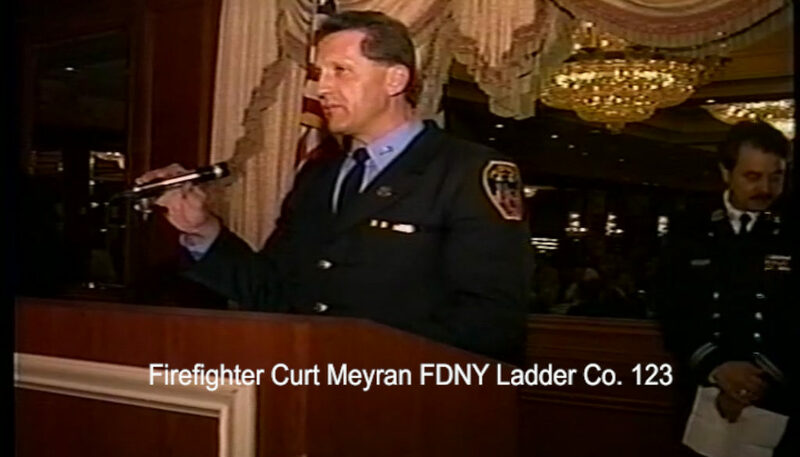 Firefighter Meyran called out to Capt. Gaetini that he had located one of the victims, and needed the sound of Capt. Gaetini’s voice to get his bearings for a quick exit to safety. Capt. Gaetini directed Firefighter Meyran to the exit, and responded that he was continuing to search for the second child. Working his way back through the dense smoke and heat, Firefighter Meyran found his way to the cellar door, and into the rear yard where he placed Tene Louise on the ground and administered first aid. Capt. Gaetini continued to crawl through thick smoke and amid storage boxes without the protection of a hand line and with the fire’s intensity increasing. While crawling around the bedroom, the beam from Capt. Gaetini’s flashlight fell upon the face of 2-year-old Alize Chalmer. He picked up the child, signaled a 10-45, and proceeded to find his way back out of the basement. As he reached the cellar stairs and the safety of the rear yard, the heavy Bilco-type cellar doors came down on top of him, entangling his mask. Thinking of the child’s safety first, he called to Firefighter Meyran to take the child from his arms as Capt. Gaetini remained snarled in the door mechanism. A member from Ladder 132 was soon able to free him. As Firefighter Meyran administered first aid to both children Capt, Gaetini issued an urgent request for E.M.S. to come to the rear. The children were rushed to Kings County Hospital, and later to the hyperbaric chamber at Jacobi Hospital. Soon afterwards, Tene Louise and Alize Chalmer were both listed in stable condition. Capt.Gaetini and Firefighter Curt Meyran could rest assured that their efforts had saved the children’s lives.